MediaDrug is a free mp3 music software solution with the following features. Installing Media Drug is a simple one time process that takes you just a few minutes. Media Drug works with Windows, Mac or Linux. Once you download and install Media Drug, you can start using it immediately. Go to http://mediadrug.com/ and click on the "Download" button at the top of the page. Select your operating system on the download page. Your browser will prompt you to confirm whether you want to run or save the file. Click on the "Run" button. Click "Yes" on any pop-ups that appear to allow Media Drug installation on your computer. Once the file is ready for setup, the installation wizard will be displayed. Follow the prompts to install Media Drug on your computer. 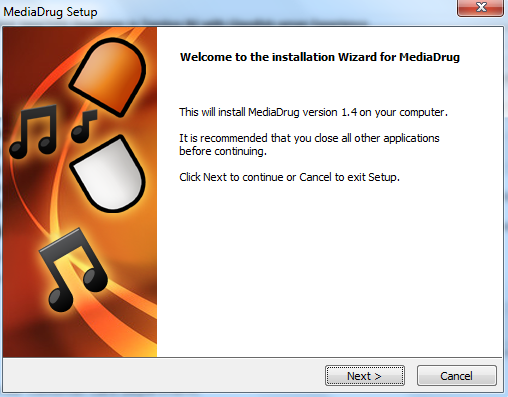 The wizard will display confirmation when the installation is complete with options to launch Media Drug and create a shortcut. Select the checkboxes to use this option and click on the "Finish" button to launch Media Drug.